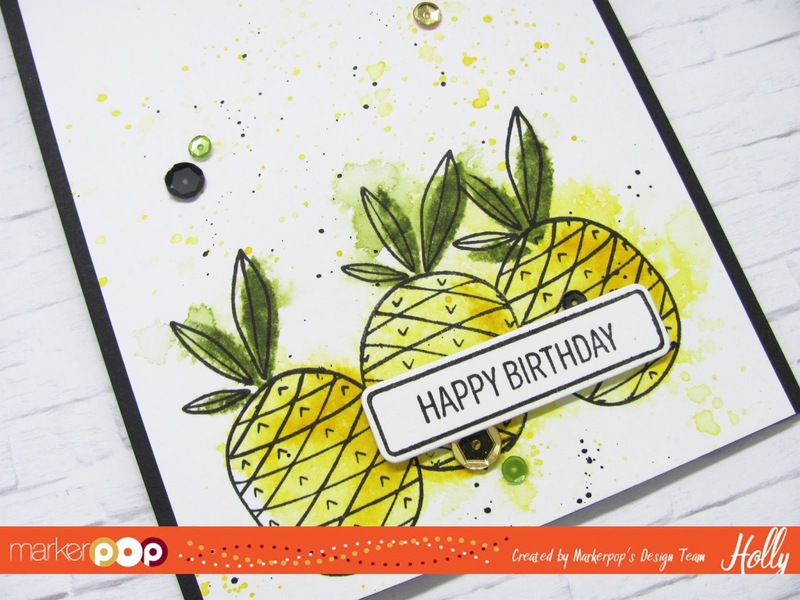 I was up on the MarkerPop blog the other day with a Fun card using the Citrus Summer set from WPlus9. This is a great set that coordinates with a few others from that release as well. 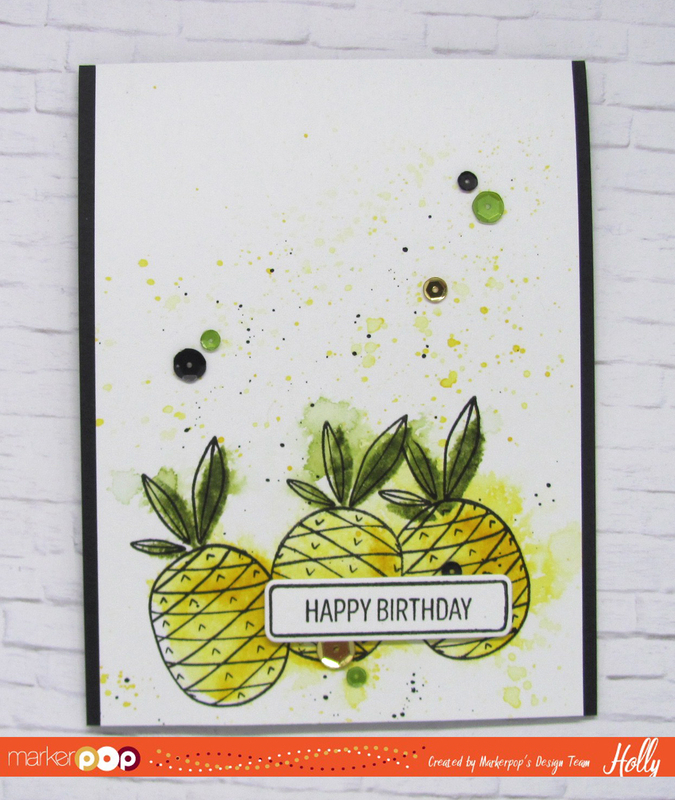 I started with a piece of Bristol Smooth paper and then I stamped the solid image of the Pineapple and stems using Distress inks. I used Squeezed Lemonade and Mustard Seed for Pineapple and Peeled Paint for the stems. I stamped each image with the Distress ink and then I spritzed it before stamping down onto the paper. Once I had the images stamped where I wanted them I spritzed the paper making the ink move around a little and I heat set it with a heat tool. I added a few splatters of the same colors of Distress Ink and heat set it on more time. Then I stamped the outline images over the Solid images off centered just a little with VersaFine Jet Black Ink. Then I added a few splatters of Black Soot Distress Paint to the background and heat set everything one last time. I trimmed a 1/16 of an inch of each side and adhered the panel to a top folding Black Licorice card base. I stamped the label and sentiment from the Basic Label set in VersaFine Black ink and used the coordinating die cut to trim it out. I adhered the label over the pineapples with some foam tape. I added some Sequins from the Neat & Tangled Peacock Feathers Mix and Pretty Pink Posh Black 4mm. Head over to the Markerpop blog for details on our Fall Video Contest and enter for chance to win a $50 GC to the store. That's a great card, I love the loose coloring.